Magoosh GRE Prep is a great option for students hoping to ace the GRE. Their subscriptions are ranked highly for its first-rate study materials, stellar customer support, and affordability. All plan options are entirely online and are accessible from any computer, tablet, or smartphone. Any questions you might have are easy to submit from within the plan’s dashboard and answered quickly by tutors. The streamlined dashboard and user-friendly features, along with the low cost of this product, make it stand out from the competition. Please note Magoosh GRE Prep is one of our affiliate brands and as such we receive a small commission at no cost to you if you choose to purchase this prep course. We investigate each course to keep you informed on both the pros and cons of each course, and hope that it helps you find the right course for your needs. Only use the links if you find this review helpful, thanks! Each Magoosh plan is 100% online. There are no class meetings, no textbooks, no DVDs, and no specific timeline. All you need is your computer, tablet or smartphone and the ability to focus on getting the job done. The personalized dashboard is a breeze to navigate, it suggests video lessons based on your progress, and compares your results with other students so that you can get an idea of your abilities and can focus on those areas that you need it most. One great feature Magoosh provides is a series of study plans that range from 1 week to 6 months, depending on how much time you have left before you take the GRE. Best of all, these plans are available to everyone for free on the website and GRE Blog, even if you don’t buy the course. Although the study plans do include instructions to practice material from the Premium Magoosh GRE course material (which you have to purchase), they also encourage the use of free resources, such as the GRE flash cards and the Magoosh GRE blog, as well as suggestions to read articles from major journals and newspapers to boost your vocabulary. You can get a 6 Month Premium subscription to Magoosh for only $149 (Get Discount) which covers all sections of the GRE. It is hard to find such good materials and a well-designed site at that price, so you should take advantage of it while it lasts! This coupon will also get you their 30-day plan for just $129, which is exactly same as the Premium course except that your course access is limited to 30 days instead of 6 months. That’s right, your Magoosh subscription is fully accessible from your computer, tablet, and smartphone (both iOS and Android). You can access all of the lessons from anywhere with Magoosh’s apps, including a flash card app, and you can use your mobile browser to get full access to the site. Study whenever and wherever it’s convenient for you! The practice questions in the Magoosh GRE course are very close to those on the actual GRE. They are ranked in order of difficulty so that you can zero in on those questions you need the most practice with to achieve your target score. As an added measure of reliability, the Score Predictor gives you a predicted range for your performance on the actual GRE. 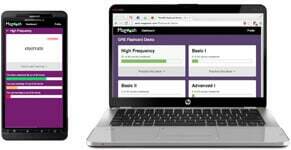 Magoosh does this by comparing your performance in the program with data from other Magoosh students, such as their official GRE scores and their performances in the prep program. 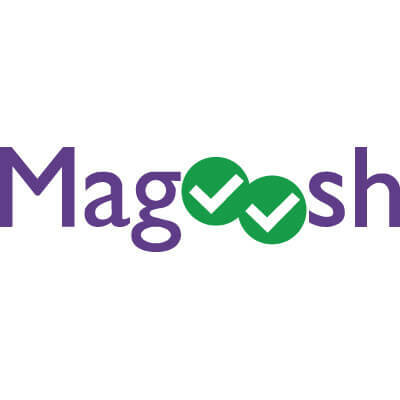 The Magoosh GRE review site is incredibly user-friendly and geared towards customized learning and flexibility. 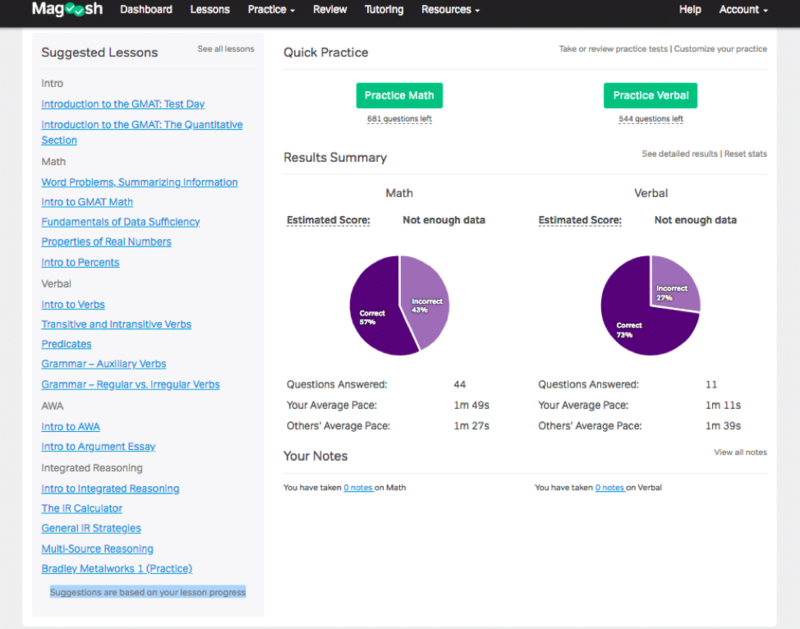 From the Dashboard, you are able to easily navigate to wherever you need to go, like practice tests and questions, suggested lessons, your notes, and your personalized Review section. Magoosh has made navigating and using the apps and site easy, so you can focus on studying. You may think that because this is an online study course, that there isn’t much personalization. That is not true. The Magoosh GRE prep course is extremely personalized. You are able to go at your own speed, rather than the set pace of a class. You can rewind and rewatch videos as you need them and skip ahead when you don’t. Right away, you’ll notice your Dashboard. This changes as you progress, giving you a personalized update of your progress. 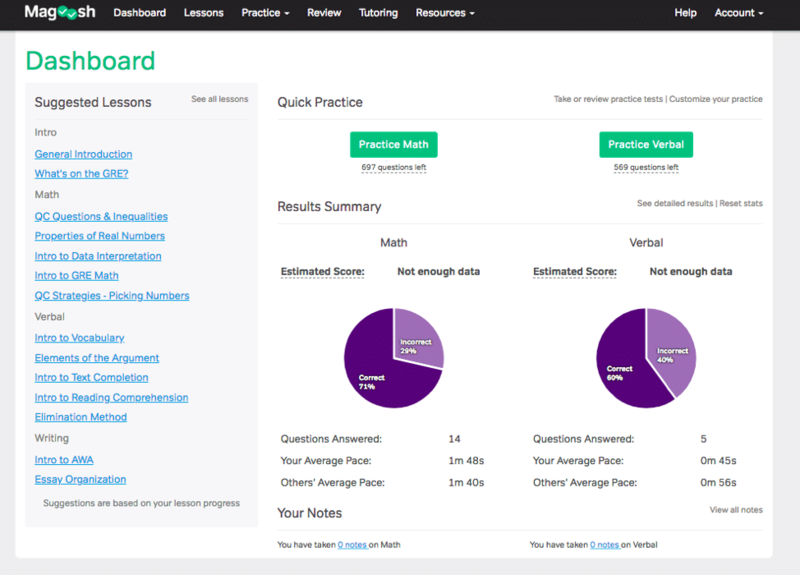 Here you have access to Suggested Lessons based on areas that you may need improvement, a summary of your results, and your estimated score. When putting together your Magoosh GRE study plan and practice session, you can customize your practice problems based on your own specific needs. Choose your level of difficulty, number of problems, types of problems, and section. You can enter “practice mode,” where the explanations are shown or “quiz mode,” where the explanations are not shown. One more way in which the Magoosh GRE test prep offers personalization is through the Notes Section. Here you can add anything you’d like to remember about that specific question, and flag it for later review. One of the best features is how far beyond the text explanation the Magoosh GRE test prep goes. If a question is particularly challenging, Magoosh does just about everything to help you understand it. The Magoosh GRE test prep offers both a text explanation and a video explanation. This feature may make the Magoosh GRE test prep app the best one for its price. The video explanation goes a little further in depth, taking 1 – 3 minutes, explaining the answer and demonstrating it at the same time. The videos take the time to explain the complexity of the problem. With the math section specifically, it is often difficult to understand a written explanation. Seeing it being solved and explained at the same time is more valuable than reading it alone. The videos also offer much more than the text explanation. They often answer “why” something works, which helps to solidify the skill, and to apply the explanation to others like it, rather than just repeating the success on that singular problem. They remind you of the basics, rules, and equations behind the problems. 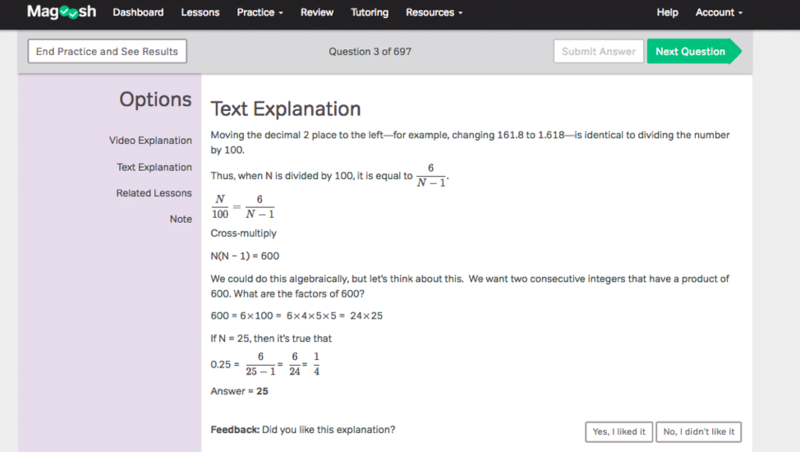 Beyond the videos, Magoosh GRE prep offers shortcuts to common problems, helping you speed up your time when the full mathematical solution is unnecessary. Often, there is a mathematical solution and a logical solution, and usually the logical solution is less complex and time consuming. Unlike other programs that will just show you the mathematical solution, the Magoosh GRE test prep will show you the logical solution. This offers you a quicker and easier way to solve what could be an otherwise difficult question. In the Test Explanation section, Magoosh GRE test prep often offers additional explanations with a link to one or two blog posts that go even further in explaining the how and why behind any given answer. They also answer commonly asked questions about the problem, addressing common mistakes and confusion. 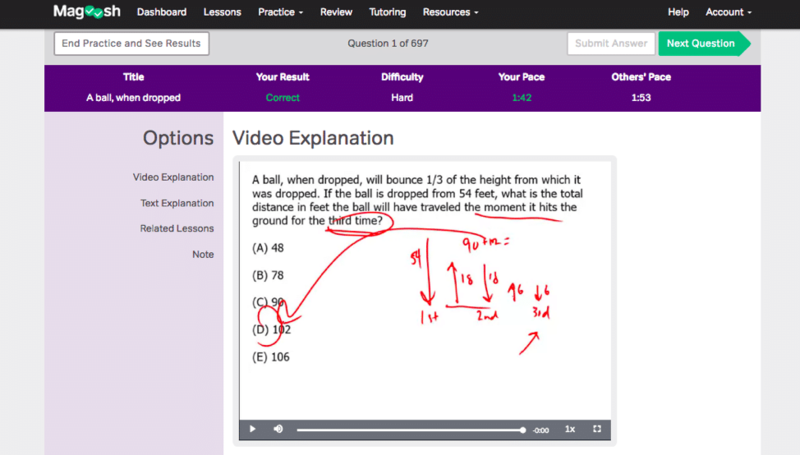 After you’ve completed a problem, and watched the video and read the explanation and FAQs, if you still have questions, Magoosh refers you to related lessons. Magoosh offers a Free Trial where you can access practice questions and lessons so you can see if you like the course before you buy anything. If after completing the premium program, you do not see a 5 point increase over your old score, you get your money back. It’s that simple. See their website for the details to make sure you meet all the requirements. If you want to give the course a test drive before you buy, you can pay for the course with the option of canceling and receiving a full refund within 7 days for any reason, no strings attached. The free Magoosh GRE blog also contains plenty of tips and strategies to score higher on the GRE, extra practice questions, and useful advice about the grad school application process. Magoosh understands that everyone has different studying needs and offers 4 GRE tutoring packages to help with this. 1. Each package is priced with an hourly rate, but the more hours you buy, the lower those rates are. Compared to other prep courses out there, Magoosh is much more flexible and cost-effective than other GRE tutoring plans. Starter – You choose 2-3 areas for the tutor to focus on and it costs $100 for a one-hour tutoring session. Verbal – Verbal focused lessons and 4 hours of tutoring for $350 ($87.50 an hour). Math – Quantitative/Math focused lessons and 4 hours of tutoring for $350 ($87.50 an hour). Premium – Covers both Verbal and Quantitative section PLUS essay grading and review. This option costs $600 for 8 hours of tutoring ($75 an hour). 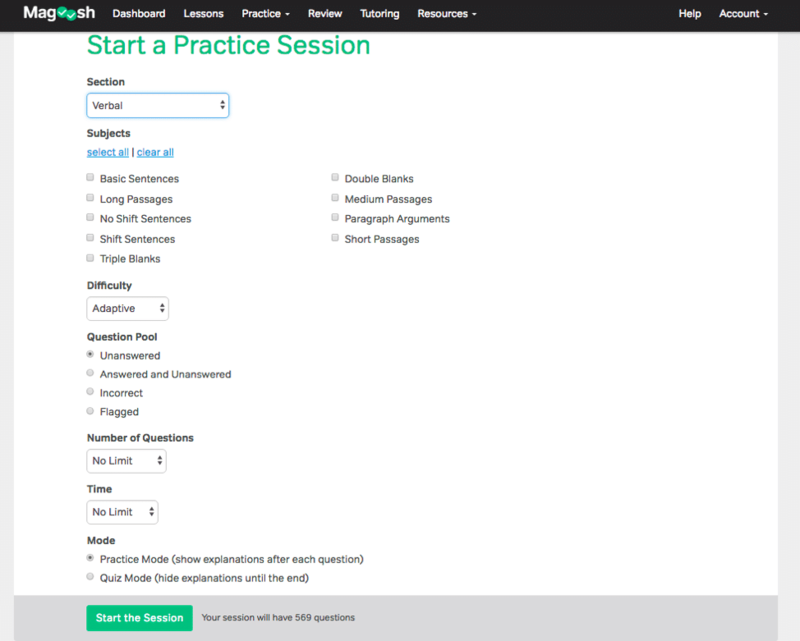 You can generate practice tests from your pool of unanswered questions, but Magoosh recommends creating no more than 3 practice tests so that you can save the rest of the questions for practice. Most competitors offer 6-8 practice tests, so that is a drawback. The Magoosh GRE test prep is entirely self-guided, so if you need a more directed approach, this may not be the prep course for you. You also need to be self-motivated, as no one will be holding you accountable. As a strictly online, on-demand subscription plan, Magoosh’s GRE prep courses work best for disciplined students who want to study at their own pace. Every single practice question (1,000+) has a video explanation, which is fantastic for those who like to see video demonstrations of how to approach and solve problems. The usual advantages of on-demand courses apply: students and professionals juggling hectic schedules will appreciate not having to commute to a traditional classroom or attend scheduled online sessions. The ability to practice questions and watch video lessons from wherever you are, whenever you want, on your computer, tablet, or smartphone has a definite appeal. Students who appreciate a streamlined interface will like the course dashboard, which is easy to navigate and includes many great features. You can customize your study experience by subject and difficulty, choose to time your quizzes or not, and view a summary of your past answers filtered by question type and difficulty. Those who want to take charge of their learning and don’t need a more structured program to keep them on task will love the freedom and flexibility of Magoosh’s course. Magoosh gets rave reviews from students, many of whom have improved their GRE score with this flexible and affordable on-demand subscription plan. Their money-back guarantee demonstrates how confident Magoosh is in their product, as they should be. If your score doesn’t improve by 5 points, you’ll get a full refund – that is a great deal. If you are serious about scoring high on the GRE and getting accepted into the graduate school of your choice, Magoosh is definitely our first pick. Sign up for their 7-Day risk-free offer and try it for yourself. TAKE ME TO MAGOOSH GRE! How much does Magoosh’s GRE course cost? No matter which Magoosh option you choose, you end up paying a small fraction of what you’d pay for other comparable courses or tutors. Their premium plans start at only $129 and only go up to $149. At $149, Magoosh offers the best value of any GRE course out there. Includes: Math, Verbal and AWA preparation, more than 200 video lessons, more than 1,000 practice questions, up to 3 practice exams, study schedules, access for 1 months, guarantee that your total score will rise by at least 5 points or your money back, score predictor, and email assistance. Includes: Math, Verbal and AWA preparation, more than 200 video lessons, more than 1,000 practice questions, up to 3 practice exams, study schedules, access for 6 months, guarantee that your total score will rise by at least 5 points or your money back, score predictor, and email assistance. Great review. I’m going with Magoosh their course seems awesome.